Today I interviewed Soffi Jikan, the Malaysian actor who spoke about his latest role in the film he proud of, Lelaki Harapan Dunia. He also spoke about working Hollywood TV series that focuses on the world traveller Marco Polo as well as directing a film about golden bridge. Here is the fill article. Excitment is written all over his face when Soffi Jikan (below) talks about his role in the film, Lelaki Harapan Dunia, which will open in cinemas on Nov 27. “In my 20 years as an actor, I believe I have given my finest performance in this film,” says the 44-year-old actor who is also into singing and directing now. What motivated him to give his best performance is the fact that he was working with a good director and a good script with a solid role. He plays a mentally-unstable outcast. “(Director) Liew Seng Tat is not a tyrant on the set where everyone is forced to listen to his instructions only,” says Soffi. Lelaki Harapan Dunia has been shown at some of the international film festivals around the globe such as Locarno in Switzerland, Toronto and Vancouver (Canada), Nara (Japan), Busan (Korea) and Kolkata (India). Next month, it will be making its rounds at two more festivals – the Taipei Golden Horse Film Festival and the Singapore International Film Festival. Soffi is not surprised the film is making an impact overseas. “While making this film, I had a gut feeling that this is a good film that will appeal to foreign and domestic audiences. Lelaki Harapan Dunia highlights an ancient Malay tradition called ‘angkat rumah’. In the olden days, whenever a villager wanted to move his house, he would literally carry the entire house to a new location with the help of his neighbours. house he found in the jungle. The villagers agree to help him carry the house from the jungle to the village. Unknown to them, an illegal immigrant has been hiding in the house. When a villager mistakes the black shadow he sees in the house as the infamous Orang Minyak, it causes panic in the village and creates several hilarious situations. Others in the cast include Wan Hanafi Su, Harun Salim Bachik, Jalil Hamid and Azhan Rani. Soffi’s journey to becoming an actor was a strange one. This anak Terengganu was working in his father’s construction company where his duties ranged from clearing rubbish to demonishing old buildings. Malaysia Film Festival), Bunohan andZombi Kampung Pisang. He also recently starred in the Hollywood-produced TV series Marco Polo which tells of the relationship between the famous Italian merchant traveller and China Emperor Kublai Khan. Produced by The Weinstein Company, the 10-episode series is scheduled to premiere on Netflix on Dec 12. It stars Lorenzo Richelmy, Benedict Wong, Joan Chen, Olivia Cheng and Remy Hii. Soffi cherished the experience working with actors from different regions such as Australia and Canada. 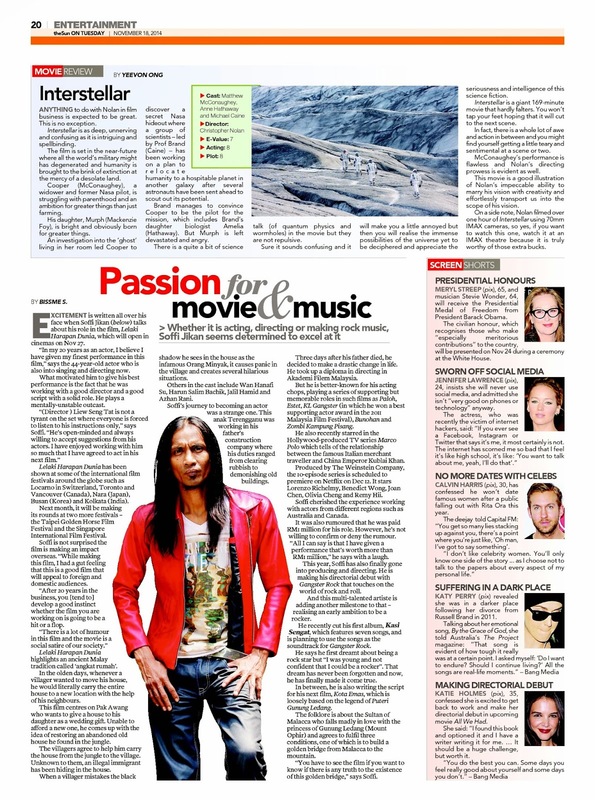 It was also rumoured that he was paid RM1 million for his role. However, he’s not willing to confirm or deny the rumour. “All I can say is that I have given a performance that’s worth more than RM1 million,” he says with a laugh. This year, Soffi has also finally gone into producing and directing. He is making his directorial debut with Gangster Rock that touches on the world of rock and roll. And this multi-talented artiste is adding another milestone to that – realising an early ambition to be a rocker. He recently cut his first album, Kasi Sengat, which features seven songs, and is planning to use the songs as the soundtrack for Gangster Rock. He says he first dreamt about being a rock star but “I was young and not confident that I could be a rocker”. That dream has never been forgotten and now, he has finally made it come true. 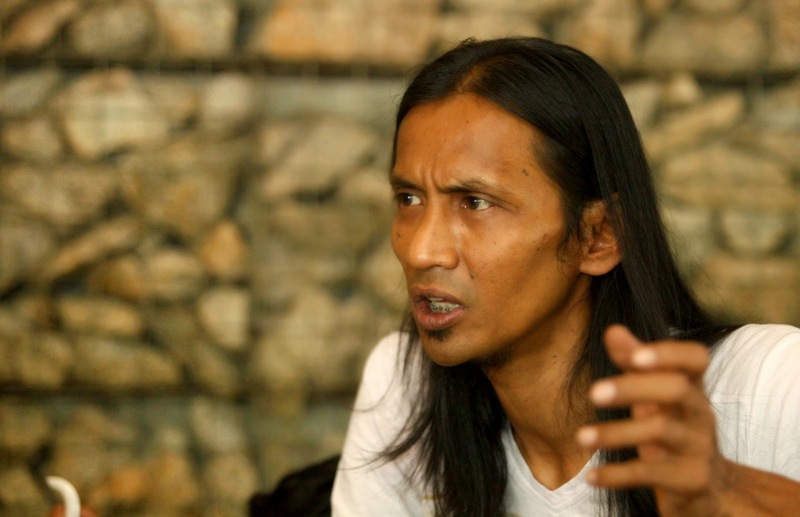 In between, he is also writing the script for his next film, Kota Emas, which is loosely based on the legend of Puteri Gunung Ledang. The folklore is about the Sultan of Malacca who falls madly in love with the princess of Gunung Ledang (Mount Ophir) and agrees to fulfil three conditions, one of which is to build a golden bridge from Malacca to the mountain. “You have to see the film if you want to know if there is any truth to the existence of this golden bridge,” says Soffi.